March 8, 2015 is the date for our upcoming Ice Floe Race. There will be a limit of 10 teams. 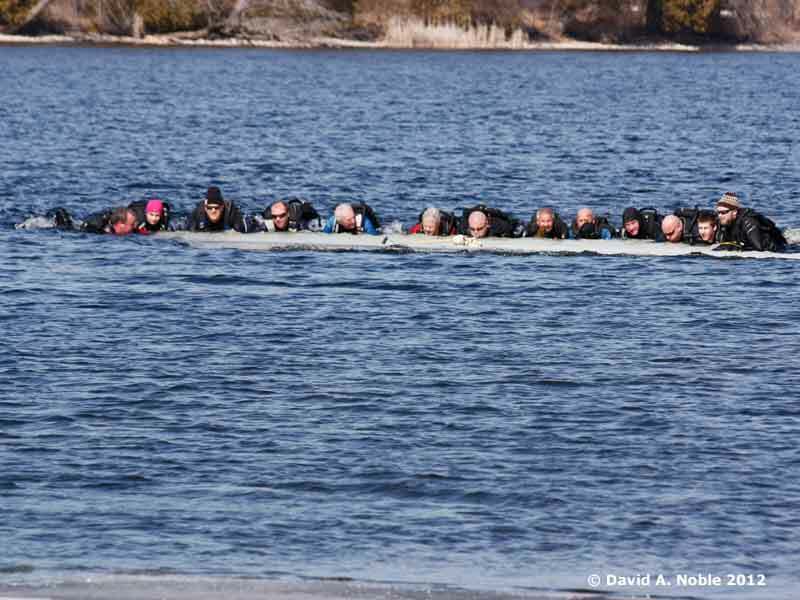 Assemble a team of between 8 (minimum) and 16 (maximum) certified divers to race. Recruit two friends to be "dry" volunteers who will help run the event. A list of volunteer roles can be found in the documentation links below. Elect your Team Captain and decide on an outrageously silly, but cool name to call yourselves. Fill out the registration spreadsheet form below and drop it into the mail to OUC along with the payment by February 13th, 2015. PLEASE PAY CLOSE ATTENTION TO FEE STRUCTURE DETAILED BELOW. * First team to have their registration form and money received by OUC will get the 1st starting postion. The next team will get position 2 and so on. Register Now! The earliest postmarked entry gets the Pole Position! Starting positions will be assigned on a first-come first-served basis in descending order. If you want to avoid all that jockeying to get around slow-poke entries, get your registrations and payments in right away! OUC members $25 per diver. Non OUC members $40 per diver. No fee for the 2 volunteers that must be provide to enter the race. You can submit more than 2 volunteers. Click on the links below to get the forms, directions and information you'll need. Addr: 150 George Street North. It is approximately 15 minutes to the race. Addr: 133 Lansdowne Street East. It is approximately 10-15 minutes to the race. Addr: 264 Lansdowne Street East. If you still have questions after working your way through the above documentation, please don't hesitate to contact me. I can't wait to see you there! Don't know what an "Ice Floe Race" is? It's where teams of certified (certifiable?) 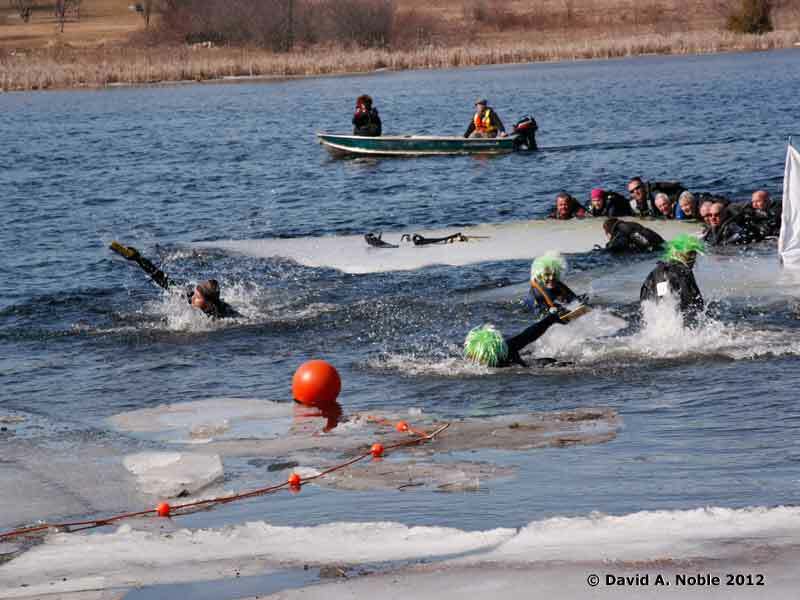 scuba divers gear up in rubber suits, BCDs and fins (no tanks, regs, or weight belts required), jump into a river, then push ice floes downstream in the fastest possible time. Why? To win the highly-coveted First Place medals, trophy and associated bragging rights. The ice floes are roughly 20 feet by 20 feet (400 feet square), about 1 foot thick, and can weigh several tons. Teams must consist of a minimum of 8 to a maximum of 16 racers, plus at least three (3) dry land volunteers. Registered teams meet at 10:00 a.m on Race Day at the Registration Tent, located at the Starting Line (Douro Lock #24 of the Trent-Severn Waterway) in Peterborough. Volunteers meet at 8:00am and Team Captains meet at 9:30am. Race starts at 11am. With a winning time of 59 min. and 33 sec. Just 33 sec. ahead of the second place finishers, Canadian Sub Aqua Club. Let's knock these guys off their soapbox in 2015!!! Blackbeard's Cruise WINNER for 2012! 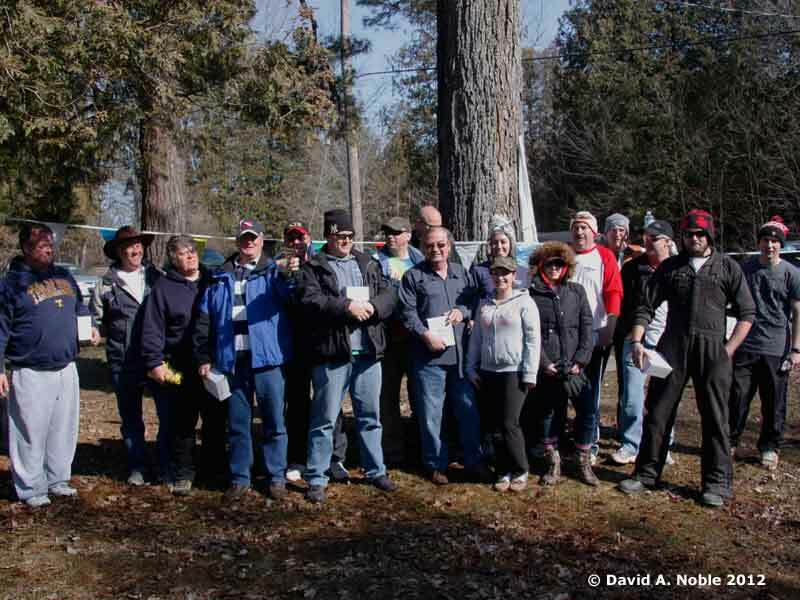 Every year, we encourage OUC Ice Floe Racers to help support a local charity. This year's charity is the Ontario Public Interest Research Group. OPIRG accepts both food and clothing donations. It is easy to donate food or clothing by dropping it off in the donation barrels which will be on-site. We are inviting everyone attending the Ice Floe Race to please bring a donation of food or clothing to help out a great cause. An Ontario Public Interest Research Group representative will be on hand to gratefully accept all donations. 2. A surface, layer, or mass of frozen water. 2. A segment that has separated from such an ice mass. < strong>a. A competition of speed, as in running or riding. b. A series of such competitions held at a specified time on a regular course: a fan of the ice floe race. 2. An extended competition in which participants struggle like runners to be the winner: the ice floe race. *Please note: To help in the global fight against e-mail spamming, all e-mail addresses on OUC's website are displayed in a scrape-resistant format. Unfortunately this format creates extra effort for legitimate users. We apologize for the inconvenience and hope you understand. dinner, transportation to the starting line, a 51st Ice Floe Race Crest, and a chance to win one of several prizes.